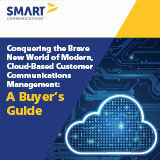 The customer communications forecast looks cloudy, but that’s a good thing! For enterprises today – especially for those in highly regulated industries like insurance, financial services, and healthcare – delivering the exceptional (and increasingly digital) experiences that customers demand requires the adoption of cloud-based platforms that allow for more seamless integrations, deeper customer insight and an overall better customer experience. But making the decision to take to the clouds is simply the first step in the journey toward increased ROI and improved customer satisfaction and retention. A lot of options are now available and it’s important to understand the differences. Not sure if you need a new phone system? Or unsure which system is right for you? Mitel will help you find the answer.